Do you have a club or restaurant? Do you want to update a listing or tell us your opinion? You can do all of that and more. 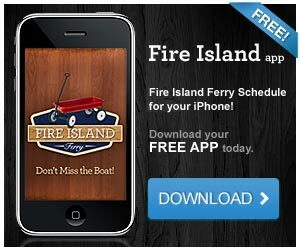 Feel free to comment on this post or join the Fire Island Business Directory. A gourmet sandwich shop. All baking is done on premises. Open 7 days a week starting at 7 a.m. Located next to A Summer Place Realty. The best pizza on the island – and delicious Italian specialties. Dine in or Take out! Located across from Joseph’s Grocery Store in the Beach Hotel Complex. The only restaurant facing the ocean on Fire Island. Unbelievable views, great food & fantastic blender drinks. Has a piano bar. This restaurant and bar is a popular grove gathering place. Great food but not the most generous of portions. Cherry’s Pit has a great second floor deck for outdoor seating and a wonderful view of the bay and the famous sunset. A popular place for benefits and charity parties Cherry’s has a great reputation for fun and community building. The bay side deck is one of Cherry Grove’s best views of the sunset, people tend to flock here as the sun paints the summer sky. This is cherry grove’s premier night spot. Incredible drag shows and theme parties. The bar has a large deck on one side, and a indoor/outdoor pool on the other. With a cool lounge, hot dance floor, and billiards tables you can’t go wrong. The birth place of Tea Dance, the Blue Whale continues the tradition with Low Tea daily from 5pm to 8pm.experience delicious dining at the blue whale. enjoy beautiful dishes prepared with organic and local produce as well as free-range and high-quality meat and fish. meat is be provided exclusively by nieman ranch, and the produce is sourced from local farms and organic purveyors. we offer fresh and exciting daily specials for appetizers, entrees and sides. you will always find fresh and delicious new dishes as well as the thoughtfully prepared comfort food you expect. bay bar café is the central hub of the pines harbor. it is a great place to enjoy starbucks coffee and read the morning paper or to grab a protein shake and chat with your friends. breakfast is served until noon. for lunch and dinner, bay bar offers a casual place to grab a bite while escaping from the summer sun and a wonderful way to curb your cravings before and after tea dance. you can even sit down and have an afternoon cocktail.